Switching power supply operation is very different to that of linear power supply. Despite of its complexity, higher bill of material cost and higher parts count, switch mode power supply is still the preferred power supply topology in the market nowadays. The main reason is higher efficiency and higher power density. Higher efficiency simply means that only a small portion of the input power is wasted while higher power density means a higher power is possible in a smaller form factor or size. This can be a step up or step down depending on the usage. Commonly this is a step down version as the usual output voltage demand is lower than the input level. This will convert AC to pulsating DC. The most commonly used rectifier is full wave bridge type as the diagram shows. A simple filter is an electrolytic capacitor. This will increase the RMS or DC level of the rectified signal. This will maintain a pure DC on the output so that will not cause problem to sensitive loads or system. Efficiency and size are the common problem associated with a linear AC-DC power supply. It is also limited only for low power applications. For high power operation, a 50/60 Hz transformer will be very huge and expensive. The filtered secondary rectified voltage must be always higher than the output by a significant margin so that the regulator can operate correctly. With this reason, the excess voltage will be absorbed by the regulator that will cause a huge power loss when multiplied by the load current. This is why the efficiency is very poor. Linear AC-DC power supply cannot provide wide input range as well. For instance the transformer is designed for 220Vac to 20Vac, you cannot use it anymore for 110Vac since you can no longer get 20Vac on the secondary. Above circuit is a basic DC-DC linear power supply. It is straight forward and very easy in the fact that there are only few components. However, its primary drawback is still efficiency and limited only for low power applications. For a linear regulator to regulate properly, its input voltage must be higher than its output voltage by a margin. The difference in the input and output voltage is by the way called as dropout voltage. Nowadays, there is already low dropout voltage linear regulator in the market. A low dropout will still introduce huge power loss at higher current operation. Below is a two stage AC-DC switch mode power supply block diagram. The first block is a bridge rectifier which purpose is to convert AC to pulsating DC. In contrast to a linear AC-DC power supply, this bridge rectifier requires high voltage rating since it directly see the input voltage. The first stage switching converter is most of the times a boost converter which functioning as a power factor correction circuit or PFC. Boost converter has an output of higher than its input. Power factor correction is needed for switching power circuit to correct the shape of the current and minimize harmonics. Boost converter is the best active power factor correction circuit because of its ability to draw current from the input in both state of Q1 (on or off). The second stage switching converter is commonly called a DC-DC section by power supply manufacturers or designers. There are lot of topology available for DC-DC like resonance (LLC, series, parallel), forward (ITTF, TTF, single transistor), bridge and full bridge to name a few. In the diagram below, the DC-DC section is an LLC resonant converter. The last block is the output rectifier and filter. For high power applications, NMOS are used instead of diodes. Below diagram is commonly used for low power offline adapters and chargers. It is only using a single switching converter on the DC-DC section which is Flyback converter. 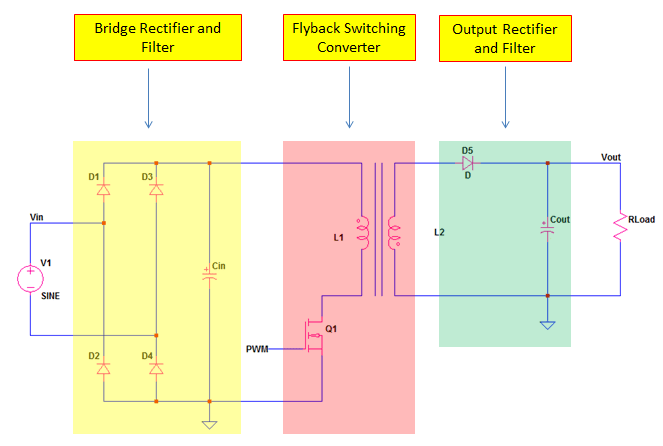 A Flyback converter is effective up to 100W power rating. In some cases Flyback is used up to 200W as long as the requirements are met especially efficiency. There is no more PFC stage since the typical or nominal power of this configuration is around 80-120W and the power factor requirement to this power range is not that strict. Flyback converter is very popular for low power offline switching mode power supply due to its simplicity and lower parts count. There are several topologies that can be used to create a DC-DC switch mode power supply. 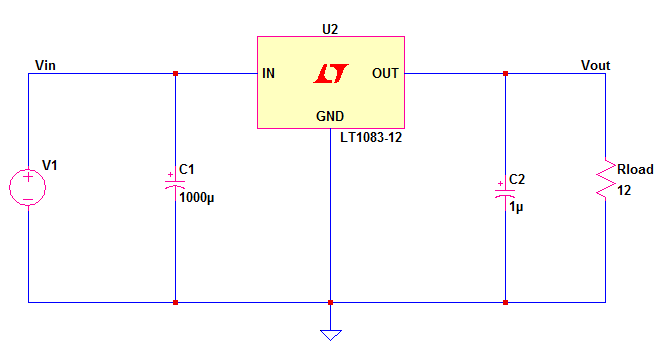 Below circuit is a DC-DC step down converter or commonly known as a buck converter. Buck converter is having an output voltage that is lower than its input. Another DC-DC switching mode power supply solution is a boost converter as below circuit. A boost converter has an output higher than its input. A combination of buck and boost converter is also possible in buck-boost topology. Below is an inverting buck-boost solution. It can be configured to operate when its input is lower than the output or the other way around. Non-inverting buck-boost is also an option but it has several components than inverting buck-boost. We show cased above some of the varieties of a switch mode power supply in both AC-DC and DC-DC forms. What exactly an SMPS does? How it is being different from the conventional linear power supply? Switching mode power supply is a kind of power supply that uses switching converter as the power section. It can be several switching converters in cascade or in parallel operation or a single one. Switching converters are the heart of switching power supplies. A switching converter operates in the principle of continuously turning on and off a semiconductor switch. Turning on means, operating the semiconductor switch like MOSFET in saturation while turning off means operating a MOSFET in cut-off. At saturation, there will be no voltage drop (ideally) on the MOSFET channel thus there is no power loss. On the other hand at cut-off, there will be no current flow so still there is no power loss. With this principle, very high efficiency is attainable. In reality, there is small power loss due to the on state resistance of the MOSFET and the turn off delay that causes a small intersection between voltage and current. Driving the semiconductor switch to saturation and cut-off is made possible through a PWM controller. A PWM controller is can be an analog application specific IC (ASIC) or a digital solution like MCU, DSC and DSP. The controller is also the one setting the regulation and other circuit protections. To discuss this well, let us consider a buck converter as below circuit. The principle is the same to all switching converters. For detailed explanation how the buck converter duty cycle derived, read the article “Buck Converter Duty Cycle Derivation”. For instance the input voltage is 20V and desired output voltage is 10V, the duty cycle is can be set fix to 50%. So the PWM signal on the above circuit must have a 50% on time. This is maybe alright as long as the input is fixed and the load is also constant. However, when there is a small perturbation, the output will easily become crazy thus it is advisable to have a close loop control. A close loop control needs a good controller (an off the shelf controller) or if you are very good in control system, you may designed your own analog or digital control. Below circuit is a DC-DC buck converter that can operate from 30-60V input with an output of24V, 75W. The power section includes the NMOS Si7852, diode SS3H9 and the inductor 47uH. The divider resistor 93.1k and 4.99k comprise the feedback network for close loop control. The voltage across 4.99k resistor is compared to the internal reference on the VFB pin of the controller. There is no way the output will deviate from the set level because of the close loop. Above is a straight forward solution and thanks to available controllers in the market nowadays. The principle behind close loop control is very technical but forgets about it since there are many hassle free solutions available in the market. To make the response of the loop fast, compensation network is needed. In the above circuit, the components attached to VC pin comprise the compensation network. The circuits that made up switching power supplies are switching converters. 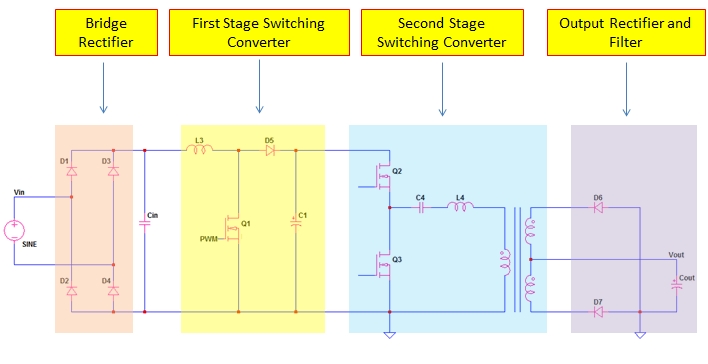 Understanding switching converter operation will also clarify switch mode power supply operation. Let me consider a boost converter circuit below. When the PWM is high (MOSFET Q1 saturates), the switch Q1 will turn on and this time the inductor L1 will charge. The diode D1 will be reversed biased and the load will rely only to the charge on the capacitor C1. When the PWM signal is low, Q1 will cut-off. The inductor will resist a sudden change in current thus it will reverse its polarity to support the same current direction. As a result, D1 will be forward biased and C1 will replenish its charge and the load will derive its power from the input. The reversal in the polarity of the inductor creates a voltage level of higher than the input (boost effect). 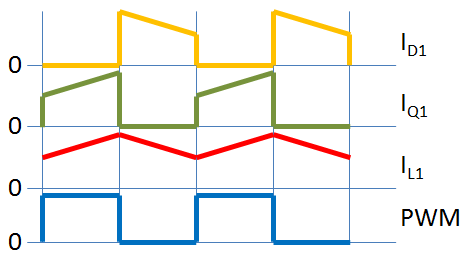 Below diagram is showing the current waveforms of the inductor, diode and MOSFET in relation to the state of PWM. The main reason why this type of power supply is so popular is the ability of giving higher efficiency. Below is a table of efficiencies attainable for switch mode power supply as standardized by 80 plus. Ploss is the total losses of the power supply. Earlier I mentioned a zero power dissipation when the switch is at saturation or at cut-off. Ideally, but there is no such ideal system. Switch mode power supply losses are coming from the RDSon of the MOSFET, switching losses, diode losses, bias losses and inductor related losses. Define the application. E.g. to what application uses the power supply, what are the surrounding conditions, operating temperatures and determine if force air cooling or natural convection. Force air and natural convection have different design approach. If you’re application needs 100W, do not design a 100W power supply. Always include a minimum of 40% margin to cater sudden over load conditions. If the budget allows, you can design a 200W power supply so that your load is always half the capability of the power supply. According to test results, switching power supply has the highest efficiency at 50-60% load. Once you have target power, select the topology to use. For power rating below 150W, Flyback is a cost effective solution. However, for higher efficiency requirement, Flyback is not a good option. You may consider resonance solution. For high power applications, say in kilowatt range, you may consider full bridge in the DC-DC section. For DC-DC application, use buck mode if you’re aiming for lower output voltage, boost mode for higher output voltage or a buck-boost if need to combine the two. This depends on the specifications and applications. For chargers and low power adapter, no need for additional PFC stage. 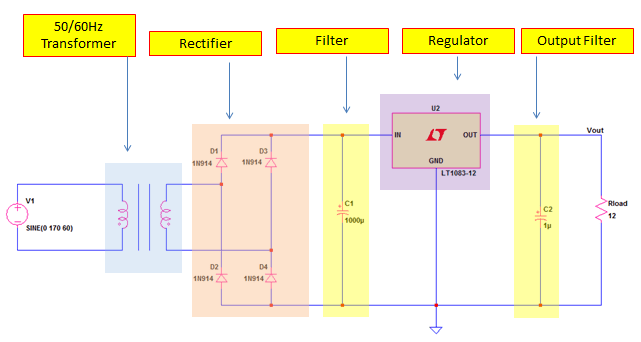 For high power or if you want to compete in the market and have the power supply certified, you need to include a PFC circuit like boost converter. 5. Do you want the product Certified by EMC Bodies? If yes, then include an EMI filter in the design. If you require very high efficiency, so consider using synchronous rectifier. You may also parallel MOSFETs to lower further the conduction loss associated with the RDSon. You may use applications specific analog controllers or go for a digital solution like MCU, DSC or DSP. Analog controllers are straight forward. Well, if you’re good in control systems, why not consider digital solution. Digital solution is very flexible as you can include housekeeping or monitoring. Proper selection of devices, watch out voltage rating, current rating as well as power rating. Be wary of the tolerances. Consider lifetime for capacitors, fan and optoisolators.